If you follow me on Twitter or Instagram, you may know I have been having a rough few weeks. Things have been building up for a while with PhD setbacks and my project coming closer and closer to the finish line (mega stress! 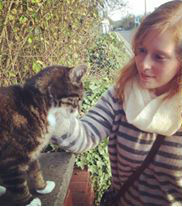 ), but I had a pretty devastating blow with my contracted teaching being cancelled last minute. Then, while I was still reeling from the disappointment of both four months salary and the work I am passionate about disappearing, I got a sudden message from my family saying our best buddy, our first and only dog, was being put to sleep that very evening. My heart and spirit was shattered. I have to be honest -- I do not cope well with bad news. I either avoid the reality completely (usually only to be hit by it full on months and months later), or I end up crushed and blanket-bound immediately. Over the years I have realized that owning my sadness tends to be the healthiest option long term, especially if I keep a few aspects of my normal routine going. That way I will get things together that much sooner. 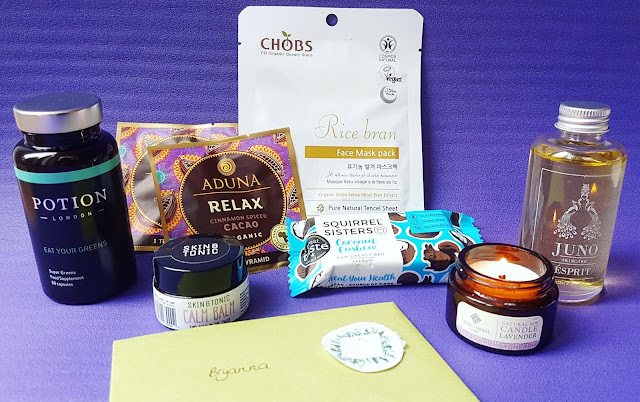 Luckily, the September edition of Natural Wellness Box arrived just a day before the start of all of this, and the "Balanced" collection was packed full of all natural goodies that calm, soothe, and boost both your body and mind. I had an entire selection of treats that were hand picked to help make encourage healthy habits at exactly the moment I most needed them. The Balanced edit contains seven products and has a value over £76, making for a great savings (over £40!). As always, the items are all cruelty free, vegan, natural, and chosen for their ability to promote beauty inside and out. I was really happy to see such variety inside the box, but also how well everything works to provide a full wellbeing session -- tea and cake, a relaxing skincare trio, a bottle of superfood supplements, and a relaxing candle to tie it all together. The very first item I experimented with was the tealight candle from Celtic Herbal. This ethically sourced 100% soy wax candle contains lavender essential oil which helps you experience a sense of calm even on the most stressful of days. "Lavender is well know for the ability to induce relaxation, aid anxiety and improve sleep quality so whenever you feel a tad restless, light this candle and feel yourself unwind & relax." This is exactly the product I need right now. I go through candles fairly regularly, so I was unsure about how sensible this size (30g) would be for me. It is definitely much smaller than I am used to, and I figured it would only last a single evening based on how long my larger ones burn for. I was right, but then I looked up how long the larger size (105g) can go for and was excited to find they burn for about 25 hours -- brilliant, and for just £10! I will definitely be buying a full size version of this in the future as I love how soothing it is, but I also realized that I might actually grab a few more travel varieties before that. While 4 hours of use is not very long, it is perfect for trying out the scents and deciding which ones fit your needs. While aromatherapy has proved to be a huge help to me, I have to say it took a much longer time for me to realize how much nutrition plays a part in mental wellbeing. It is so tempting to just binge on junk when you are feeling upset, but that actually leads to you feeling worse as you are overloading on heavy carbs, sugars, and salts and skipping much needed vitamins and minerals. I love that Natural Wellness Box always has a healthier snacking option, and the Squirrel Sisters Coconut Cashew Raw Vegan Energy Bar was the perfect solution to my need for comfort food. It was delicious, filling, broke apart nicely making it easy to nibble on over a few hours, and had no nasties in it -- just what a recovering spirit needs! I had not actually heard of Squirrel Sisters before, but now will be keeping an eye out for these 'Great Taste' snacking bars. I really like that they are raw and 100% natural, and they are perfect to have around for when you are craving something a bit sweet but don't want to sacrifice nutritional value. Now for the hard choice -- to pick the same yummy flavour, or to opt for Raspberry Ripple, Cacao Orange, or Cacao Brownie?? 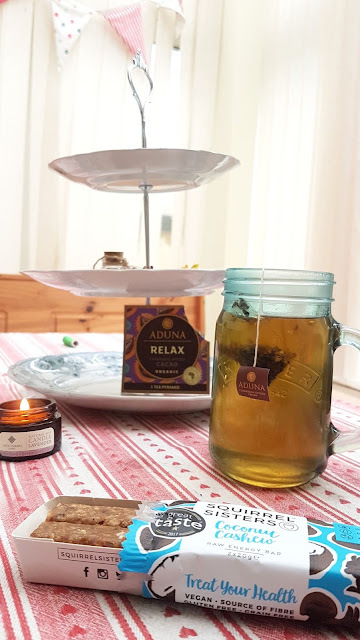 The energy bar paired perfectly with the Aduna Relaxing Super Tea, a drink that is so much more than your average afternoon cuppa. "A warming embrace of chocolatey cacao, spiced with gently crushed cinnamon and cardomom. Sit back, revel in the delicious aroma and allow the ancient soothing power of African cacao to calm your mind and lift your spirits." I have to agree with this blurb from Natural Wellness Box, as the tea is so incredibly wholesome and from the very first sniff (and sip!) you are embraced by a quiet sense of calm. It smells of holidays, fireside evenings, and cozy comforts, and the ingredients are packed with luxurious organic spices that bring a host of health benefits, including supporting the digestive and immune systems. Cacao is perfect for anyone feeling down, as it releases endorphins, plus is rich in neurotransmitters which help produce a sensation of relaxation and euphoria -- just what the doctor ordered! One superfood is covered with the Aduna Relaxing Super Tea, but Natural Wellness Box does not stop there! 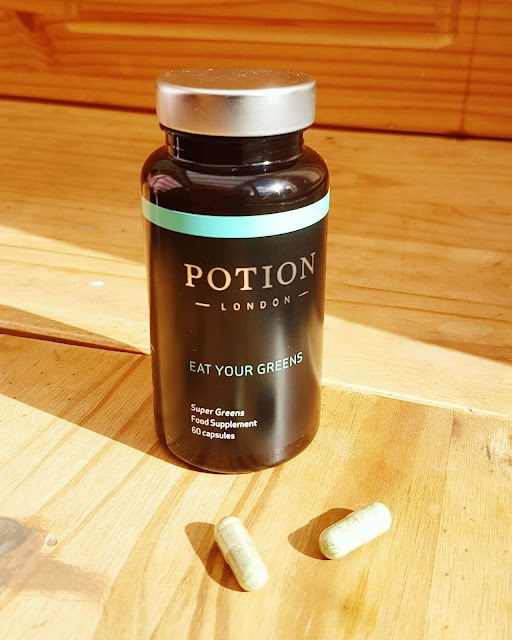 For the Balanced edit, they have ensured that your health is totally sorted with another superfood savior -- "Eat Your Greens" from Potion London. "Potion London launched in summer 2016 with a range of supplements promoting ‘beauty from within’. The brand aims to make life easier and take the confusion out of food supplements by offering one-a-day solutions to common nutritional needs; the range has been specially developed by nutritionists to provide the optimum nutritional intake for each particular requirement." These super greens food supplements are unlike any other I have tried before. The ones I have tried in the past have all been loose powders that you sprinkle on top of your breakfast or mix into your smoothies. They tend to smell of mulch, and while some taste fine once blended, there is usually a hint of algae still remaining which is hard to get used to. Not the case here. Potion London has created a capsule that is vegan friendly and filled with six beauty-boosting, anti-ageing, antioxidant rich, anti-viral superfoods: barley grass, wheat grass, spirulina, beetroot, spinach, and kale. You just pop one (or two if necessary) in your mouth and wash it down with a gulp of water - no nasty taste, and no mixing or blending or masking required! I take mine after finishing lunch, as this is when I take my iron pill so I find it easy to remember. It has not been long enough yet to know if these have made a difference in my skin, muscle strength and performance, or cholesterol levels, but if I do after the 60 capsules are gone, I may just have to buy a second bottle. My only complaint with this is I could not find the nutritional percentages anywhere - not on the bottle, their website, or any of their retailers (like Harvey Nichols). I was able to find the ingredient dosages in mg, but I am not knowledgeable enough about these superfoods to know what the daily value of vitamins and minerals would be with this information. For someone who already takes prescription supplements (I'm anemic), it is really important to know what I am consuming so I can ensure that I am not taking too much. Next up in the Balanced collection from Natural Wellness Box (and possibly my favourite item!) is this limited edition bottle of Espirit Luxury Bath and Body Oil from Juno Luxury Skincare. I have used this twice now, and I have to say I am well impressed. 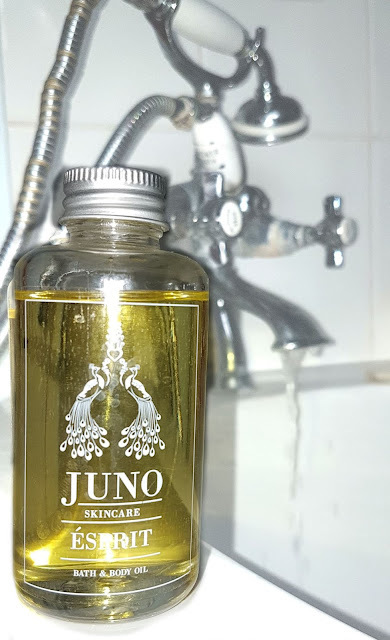 Brighton based Juno Luxury Skincare uses cold pressed oils to create a sensual bath sensation that is ideal for lifting the spirits and relaxing the body. With almond, ylang ylang, geranium, frankincense, rose, jasmine, patchouli, neroli, and more, this oil smells so intoxicating. It is a light oil, not overly slick, and perfect for a long soak. All the botanicals really help ease the mind and lessen any tensions, so this has been a wonderful addition to my bath goodies. I will be really sad when this is gone as the normal bottle is only 30ml compared to this which is at least 100ml, but I am thrilled that I have many more self-care sessions to look forward to with this limited edition release. And during my next bath, I will be taking time to enjoy another fab face mask from Chobs, a brand I have reviewed several times now and continue to be impressed by. Included in the Balanced edit from Natural Wellness Box is the organic Rice Bran sheet mask, a treatment ideal for fatigued skin in need of extra elasticity and moisture. I love that these masks are Soil Association certified, all natural, made from sustainable fibers, and fit the face unlike many other sheet masks on the market. I have really enjoyed the other varieties I have tried, so I am looking forward to having a little pamper once more thanks to this lovely addition to the September box. 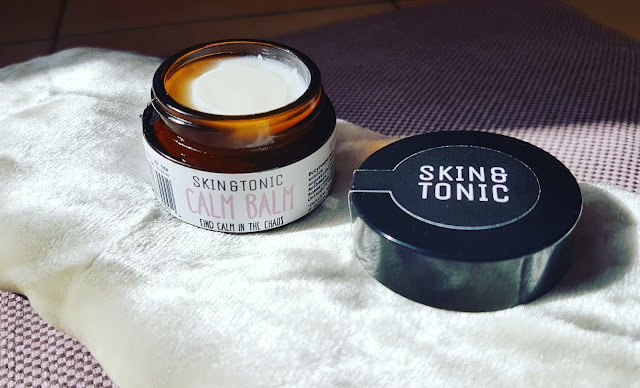 Last in the latest Natural Wellness Box, but certainly not least, is the newly revamped "Calm Balm" from Skin & Tonic. This is a "dreamy, creamy balm made from a blend of natural butters and oils including nourishing Shea butter and calendula" and provides a sense of calm while also moisturizing skin. Skin & Tonic announced their version 2.0 a few days ago, stating "Our new Calm Balm is a silky smooth, creamy balm with a dreamy lavender & chamomile scent. 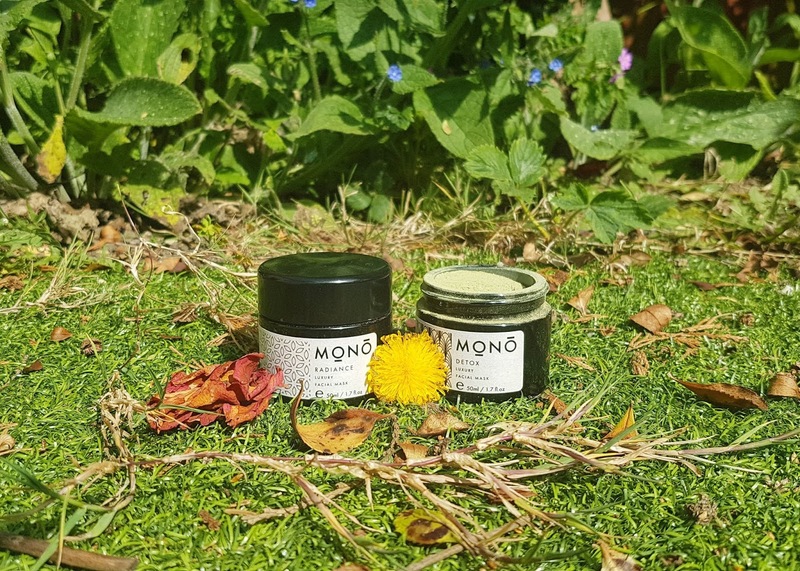 Perfect for soothing dry hands, lips, eczema, shaping brows or wearing as a nourishing night mask & massaging into temples when you’re stressed. We’ve even reduced the price - now available for £12.50 (every girl’s handbag must-have)." I have to agree - this mini Calm Balm fits perfectly in your bag and is ideal for a quick aromatherapy treatment on the go. Anxious in public? Dab a bit on your pressure points and take a deep breathe. Need to quiet your mind before bed? Pop some on around your nose, close your eyes, and inhale until you are dozing off and dreaming soundly. The smell of this is a little overwhelming at first if I am totally honest, but that does mean it lasts longer than I expected. Once the aroma settles, it is lovely, but when first applied it reminds me of freshly washed cotton which I am not super keen on. But my partner seems to love it so this will definitely be used consistently! Plus, it really helped bring some peace to my unsettled mind over the last week, so it has proved itself useful and potent. Overall I am really happy with the contents of the Balanced edition of Natural Wellness Box, and I have to say I am genuinely grateful for the timing of its arrival. It has been a dreadful week or so, and having so many comforting aromas and healthy nutrient rich treats has really helped get me sorted out. Mood boosting skincare, yummy snacks, and more, this box really has everything you need to balance out your mind, body, and skin. Perfect for #SelfCareSeptember and perfect for a girl in need of some serious heart-healing goodness. So what did you eco-lovelies think about this edit?? Did you love all the self-care and natural wellbeing treats? I would love to hear what your favourite was -- let me know in the comments below! And if you are interested in subscribing to Natural Wellness Box and receiving your very own themed luxury collection, head over to their website and sign up! You can even grab 10% off your first box by signing up to their newsletter. You can get a bi-monthly subscription, a one off box, or pre-pay to get an even bigger savings! * Natural Wellness Box kindly provided this box for this review. All opinions expressed in this post, however, are my honest thoughts and have not been influenced in any way. It's a really lovely box, full of goodies. Sounds really nice and perhaps a little comfort during such a tough time. This is fantastic and a great idea. I'd love a box like this!